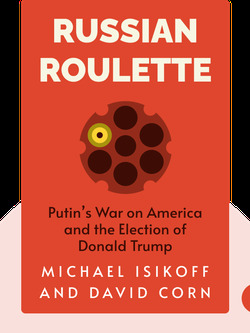 Russian Roulette (2018) relates the results of an investigation by two journalists into the Russian interference in the 2016 American presidential election. These include details on Trump’s business ties to Russia, the Russian connections of his campaign team, the Russian hacking of Democratic institutions, the disinformation campaigns on social media and what Russian intelligence might have gathered to compromise Trump. The blinks also tell how the American intelligence community and the Obama administration reacted to the Russian hacking. Donald Trump sought to expand his business into Russia and displayed admiration for Russian president Putin. On November 9, 2013, the Crocus City Hall in Moscow was being prepared for a lavish extravaganza. The occasion centered around Donald Trump – the American business mogul and star of his own reality TV show – who was using the location for his most prized asset: the Miss Universe pageant. But this event was more than just a beauty contest. Trump had picked Moscow because he was eager to meet and make a good impression with Russian president Vladimir Putin, in the hope that he could expand his business into the country and even build a Trump Tower in Moscow. While Trump was nervous about whether Putin would show up for the pageant, he was also dealing with some bad press. By choosing Moscow as the event location, Trump had angered human rights organizations protesting against recent anti-gay legislation approved by the Russian parliament. The new law banned any so-called “gay propaganda,” under the justification of protecting children from being exposed to anything non-heterosexual. As a result, the Human Rights Campaign had demanded that he relocate the Miss Universe pageant, but Trump was determined. He’d been planning this business opportunity for too long, and by now too much was on the line. Aside from Putin, Trump was also looking forward to working with Emin Agalarov; an up-and-coming pop star from Azerbaijan that Trump had booked to perform. But it wasn’t just his musical talents that had Trump interested: Emin was the son of Aras Agalarov, a billionaire developer who was adept at cutting through Russian red tape in order to get projects moving. Sure enough, after the event, the Trump Organization and Agalarov’s company signed a letter of intent to construct a Trump Tower in Moscow. As for Putin, Trump was persistent in his public praise for the man, all in an effort to get his blessing for the project. Over multiple tweets, he had nothing but nice things to say about Putin’s intelligence and leadership abilities. This was just the news that Trump had hoped for, but a traffic jam would mean that Putin didn’t make it to the pageant. The Obama administration hoped to reset US-Russian diplomacy, but sanctions stalled Trump’s plans. While Russian hackers attacked the Democratic Party, Trump temporarily renewed his Moscow plans. Trump's campaign team had several staff members with deep Russian ties. The Trump team neglected to disclose important information to law enforcement. After closing their investigation into Clinton’s emails, the FBI turned its attention to Trump. As Wikileaks published stolen emails, the government grew more alarmed. Obama confronted Putin about Russian interference, while the intelligence community prepared a statement. An important statement from the intelligence community was overshadowed on a wild news day. With Trump elected president, the Russian operation succeeded while the full scope remained under wraps. Start your free Blinkist trial to get unlimited access to key ideas from Russian Roulette and over 3,000 other nonfiction titles. With bitesize text and audio, it's easier than ever to find the right ideas to transform your life.